If Walker Digital has its way, Activision Blizzard will have to pay up big for allowing online multiplayer in its games. 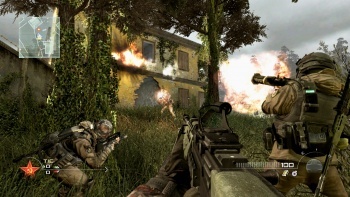 Digital business corporation Walker Digital, parent company of Priceline.com and holder of hundreds of patents, recently filed a lawsuit against Activision Blizzard and Zynga for infringing on one such patent involving a "distributed electronic tournament system." The titles that Walker says infringe on its patent run the gamut, from the entire Call of Duty series to World of Warcraft. At the heart of the matter is a patent issued to Walker Digital in 2002 for a "database driven online distributed tournament system." The expanded patent describes "a method and a system for a distributed electronic tournament system in which many remotely located players participate in a tournament through input/output devices connected to a central controller which manages the tournament." Walker Digital names Activision Inc., Actvision Publishing, Activision Blizzard, Blizzard Entertainment, and Zynga in the lawsuit, alleging that 24 of their products are infringing. These include most of the companies' popular online titles, such as both Modern Warfare games, World of Warcraft and its expansions, DJ Hero, Mafia Wars, and even the Wii remake of GoldenEye 007. The lawsuit doesn't nail down a specific amount of compensation Walker Digital feels it's owed yet, but says this number will be "ascertained through discovery or at trial." Considering the scope of the titles named, it'll likely be gigantic. Last month, Walker Digital filed a lawsuit against Facebook over a patent regarding the management of information about one's self, so the company appears to be trying to make its bones by patent trolling to some degree.